Power supplies have taken a fresh hit in the Hamas-run Gaza Strip, with authorities Saturday accusing the rival Palestinian Authority of blocking fuel payments to Egypt from going through banks. 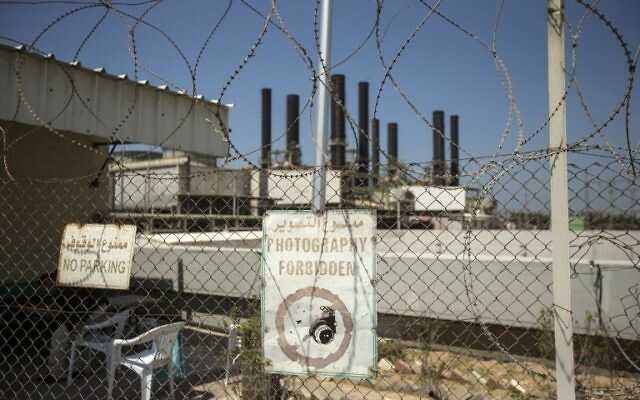 The Energy Authority in Gaza is paying Egypt for the fuel but must make transfers through Palestinian banks, which are based in the West Bank and under Palestinian Authority laws. A spokesman for the PA government in Ramallah, Tarek Rishmawi, told AFP that “the main reason for the worsening situation in Gaza is Hamas as they rejected the initiative of (PA President) Mahmoud Abbas to end the split” between Palestinian factions. He did not confirm or deny the allegations of blocking fuel payments. The electricity distribution company confirmed only one generator was operating, producing 23 megawatts of power — which added to other sources means Gaza currently has a total of 93 megawatts a day. More than 500 megawatts are required to serve the Palestinian enclave’s population. Abbas, who runs the West Bank-based PA, has recently sought to squeeze his longtime rivals Hamas, who control Gaza. His government recently stopped paying for energy to Gaza, leading Israel to start reducing it. The cut left the impoverished territory of more than two million people with as little as two hours of mains electricity a day. As an interim measure Egypt stepped in to deliver fuel to Gaza’s sole power plant, but that has now been threatened. The Egyptian deliveries came as part of improving relations between Cairo and Hamas.